You already know that Florida is the theme park capital of the world. And you're well aware that the state also has some wonderful roller coasters. But, dd you know that the state also boasts some of the planet's coolest water parks? It’s true. Among the very best are Aquatica at SeaWorld Orlando, Volcano Bay at Universal Orlando, and the two parks at Disney World, Typhoon Lagoon and Blizzard Beach. What's more, a few of Florida's water parks are the only ones in the U.S. that are open throughout the year. (Well, outdoor water parks anyhow. There are indoor water parks in other parts of the country that are open year round). Most of the bigger water parks are located in Central Florida near the major theme parks, but there are places to get wet throughout the state. Parks are arranged alphabetically. Adventure Island is a large park located near Busch Gardens Tampa and operated by the same owner, SeaWorld Parks. Attractions include tube slides, body slides, toboggan slides, a speed slide, mat-racing slides, family raft rides, a wave pool, an interactive water play center with splash bucket, an activity pool, a lazy river, volleyball courts, and play areas for younger kids. Adventure Island requires separate admission from Busch Gardens Tampa, but the park offers discounted package deals that combine admission to any combination of the water park plus SeaWorld Orlando, Aquatica Orlando, and/or Busch Gardens Tampa Bay. Adventure Island is open seasonally. Aquatica is a huge, highly themed park located near SeaWorld Orlando and operated by SeaWorld Parks. Attractions include tube slides, body slides, raft slides, bowl rides, mat-racing slides, family raft rides, wave pools, activity pool, a lazy river, an action river, live animals, interactive water play center, and play areas for younger kids. Aquatica requires separate admission from SeaWorld Orlando (and from Discovery Cove, SeaWorld's dolphin experience park). As with Adventure Island, the park offers discounted package deals that combine admission to any combination of the water park plus SeaWorld Orlando, Adventure Island, and/or Busch Gardens Tampa Bay. Aquatica is open year round. Big Kahuna's is a good-sized park with a lazy river, a FlowRider surfing attraction, speed slides, body slides, a wave pool, a kids interactive play area, mini-golf, and a Skycoaster. It is open seasonally. One of two Walt Disney World water parks, (the other is Typhoon lagoon, listed below) Blizzard Beach is an enormous, well-themed park. Attractions include an enormous speed slide (which just may be the most thrilling attraction in all of Disney World), a lazy river, a wave pool, a mat racing slide, tube slides, body slides, a family raft ride, and interactive water play areas for younger kids. Blizzard Beach requires separate admission from the theme parks. When both water parks are open, a daily pass allows guests admission to both parks in the same day. The water park is open year round, although it does close for a couple of weeks in the winter for an annual refurbishment. Located in Weeki Wachee Springs State Park, the small water park offers water slides, speed slides, a lazy river, and a large, spring-fed pool. Buccaneer Bay is open most of the year, but takes a break from early February through mid-March. The park is included in admission to Weeki Wachee Springs State Park, which also includes the famous mermaid shows. CoCo Key is a medium-sized park that offers body slides, tube slides, an interactive water play center, a zero-entry toddler pool, and a teen pool. It is open to registered hotel guests as well as to the general public based on availability. CoCo Key is open year round. Daytona Lagoon is a medium-sized park with an interactive kids' water play area, wave pool, tube slides, body slides, speed slides, and lazy river. Part of a family entertainment center, the facility also offers go-karts, a rock wall, laser tag, and mini-golf. Legoland Water Park is medium-sized with tube slides, body slides, racing slides, a speed slide, a wave pool, a lazy river, an interactive water play center, and play areas for younger kids. It requires separate admission from Legoland and can only be purchased in combination with passes to the theme park. The water park is open seasonally. Rapids Water Park is a large park with a lazy river, wave pool, children's play area, funnel ride, FlowRider surfing ride, launch capsule slides, family raft rides, multi-lane mat-racing slide, body slides, tube slides. It is open seasonally. Sam's Fun City is a medium-sized park with tube slides, body slides, activity pools, and a lazy river. The family entertainment center also includes go-karts, amusement rides, mini-golf, and bumper boats. The water park is known as "Surf City." The dry rides are open year round. The water park is open seasonally. Shipwreck Island is a medium-sized park with a wave pool, lazy river, family raft ride, speed slide, body slides, tube slides, and a play area for kids. It is open seasonally. Shipwreck Island is a medium-sized park with an uphill water coaster, halfpipe ride, bowl slide, wave pool, lazy river, tube and body slides, and a kiddie cove. The family entertainment center also includes mini-golf, laser tag, a kiddie roller coaster, and go-karts. The dry rides are open year round. The water park is open seasonally. Sun Splash is a small park with waterslides, activity and family pools, otter slides, speed slides, an inner tube river, and a children's play area. It is open seasonally. Typhoon Lagoon is a huge, highly themed park with a water coaster, a lazy river, body slides, tube slides, speed slides, a family raft ride, and an enormous wave pool. Like Blizzard Beach, it requires separate admission from the theme parks. When both of the water parks are open, a ticket allows guests admission to both parks in the same day. Typhoon Lagoon is open year round, although it does close for a couple of weeks in the winter for an annual refurbishment. 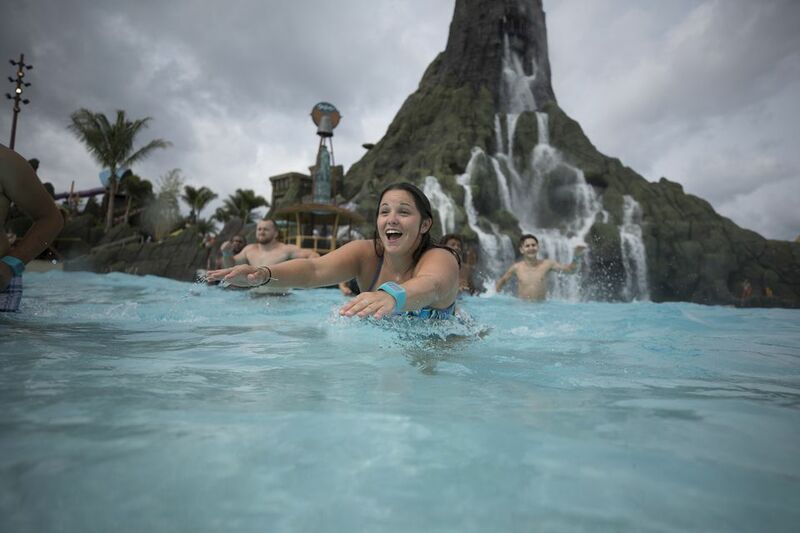 Volcano Bay is a huge, highly themed park located at Universal Orlando. The centerpiece is a 200-foot tall volcano which includes the Krakatau Aqua Coaster. Other attractions include some of the world’s scariest speed slides (seriously! ), family raft rides, a multi-directional wave pool, body slides, and tube slides. All guests get a complimentary Tapu Tapu wearable device which eliminates lines for the attractions. Volcano Bay requires separate admission from the theme parks. It is open year round. Wanna Get Wet in Minnesota? Go to a Water Park!